Home | Blog | Multi-Car Accident — Who is at fault? The thought of getting in a car accident is an upsetting topic for many, but the truth is it happens to thousands of people each day. Having a general understanding of the law when it comes to a car accident can help relieve some anxiety if you ever find yourself in one. When it comes to multi car-accidents, there are general rules that can be applied, but not all accidents are cut and dry. Based on the details of the accident, who is at fault can vary on a case-by-case basis. Generally, in a two-car accident where the second car rear-ends the first, the second driver is at fault. 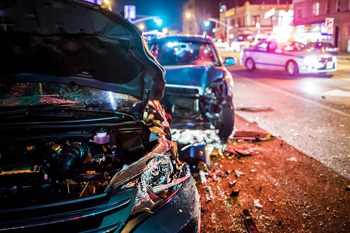 The person liable in a multi-car accident can range from the front vehicle to the last vehicle, it’s all dependent on who set off the chain of events. For example, if the last vehicle pushes the middle vehicle into the front, the driver of the last vehicle is liable because they set off the chain of events. There might be situations where more than one driver is at fault. In most cases, more than one driver is negligent. One driver might not have used a turn signal, while another might have been speeding. In those cases, liability is divided among those drivers. For example, one driver might be faulted 80 percent of the accident, and another 20 percent. The percentage of responsibility can determine how much a driver can claim. If a driver was faulted for 20 percent of the accident, he can only claim 80 percent of the damages. Maneuvering a multi-car accident claim can be confusing and frustrating. Insurance agents can be pushy and unsympathetic. It’s important to work with a professional who is looking out for your best interest. KBG Injury Law is here to insure your best legal interests are protected. In the instance of an auto accident or any other form of personal injury, contact KBG today for a free consultation. We will help you get the Results You Deserve®.